I was pretty busy today because I went to Prague to visit my good friend which means I spent more that 3 hours in the train. Usually I am pretty bored during travelling but this time I wasnt. I was finishing my article for magazine and reading Jons book which is really hilarious. I just should remember that my crazy laugh can make some people think that you are mental 🙂 Thanks to the time pressure I will post pics that werent taken this month but I am sure it doesnt matter. Dneska jsem byla v jednom kole, protože jsem jela do Prahy navštívit moji dobrou kamarádku, což znamená, že jsem strávila více než tři hodiny ve vlaku. Obvykle se při cestě pěkně nudím, ale tentokrát ne. Dokončovala jsem totiž svůj článek pro časopis a četla si Jonovu knížku, která je vážně legrační. Akorát bych si měla zapamatovat, že můj bláznivý smích přesvědčí lidi okolo, že jsem pošahaná 🙂 Kvůli časové tísni dneska vložím obrázky, které nebyly nafoceny tento měsíc, ale jsem si jistá, že to nevadí. Previous Post Luxury vs. Economy. High Class Party. Next Post 1 piece – 2 outfits. Dress. Wooow this is beautiful, the combination is great!! !I love your pants!! Thank you so much, dear! No I didnt change it. It is an older pic :)Kisses, Lucy! Absolutely adore this outfit! 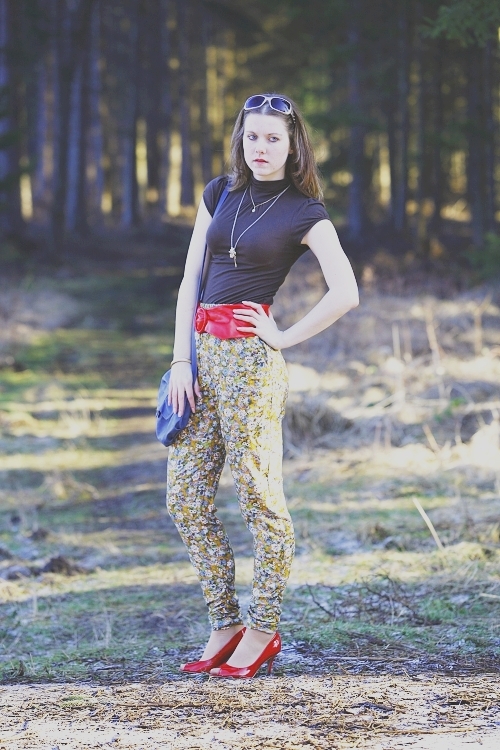 The floral pants with a pop of red in belt and shoes is just fabulous! You look awesome!! Thank you! No, sweetie, I didnt change my hair:) You are the second person who asked me. It is said in the post that those pics are older. I would never change my hair colour..love it to much:)Kisses!!! Wow, great look! Love those trousers! I would love to visit Prague. You look stunning. I absolutely love the flower print pants. This look is so beautiful! I've never been on a train, but I've spent eight hours on a bus and I hated every second. I feel your pain, but it's always nice to be busy and prepared! Ahh, nice pants! If you want you can read my blog, there are the flags! Wow! Great pants 🙂 You look awesome! your pants are too cute! You have nice blog, you can see Czech fashion blogs at:http://look10.blogspot.com/2010/02/fashion-chequia-ceska-republika-blogs.htmland around the world:http://look10.blogspot.com/2011/06/global-fashion-blogs.htmlalso can put your blog on this site for free:http://look10.blogspot.com/2010/02/formulario-de-inscripcion.htmlGreetings. Your style is absolutely adorable!! !